Was working in some World War I Draft Registration Cards and I have never seen this before, although I have looked a many in that past. Its in the Lower Left corner of the "front" side of the card. Was given a file that I will return to the owner. How to communicate the work that I did and way. A few times on what I have done. Ancestry has added a new feature, at least on the Social Security Death Index transcription that we see online. 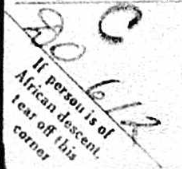 This is not an image, this is a transcription from Ancestry from a record that they have and that we can NOT see. The End Users should NOT be able to Add alternate information to what we see. I, for one, have reported an issue stating that we should NOT be able to add information. Yes, we may have additional information, but not to this type of a record, or INDEX. It's a great feature when we are looking at an Image AND our view of an item on the Image is different from that which is transcribed, but not to an Index. If you agree, please report issues on these types of records to Ancestry. Discovered that a person had been married twice and have Children connected to the wrong Mother. Here is how to resolve this.